No matter your entertainment budget, there are always wonderful ways to spend time together as a family in Mid-Michigan. Every month we’ll highlight free events every family can enjoy! Join Mount Pleasant Community Church at the Chippewa Nature Center for a free Family Fun Nature Day February 2nd, 2019. There will be indoor and outdoor scavenger hunts and plenty to explore together as a family from 10am – 12noon. RSVP at mpcc.org/events. If you’re looking for an activity to do with older kids, you may want to check out this fun and free event hosted by the Chippewa Watershed Conservancy on February 2nd, 2019. Families can go snowshoeing at Sylvan Solace. To reserve snowshoes, call 989-772-5777. Have a Home Depot nearby? Kids can make a Valentine Candy Box at this month’s free kid workshop on February 2nd, 2019. If you live in Midland or Mt. Pleasant, workshops are scheduled between 9am – 12noon. Kids will get to take home their craft, receive a certificate of completion, a workshop apron and commemorative pin while supplies last. The West Midland Family Center wants to keep you moving despite the cold temperatures winter brings. This February 5th, 2019 families are encouraged to come out and give martial arts a try at no cost. Participants must sign a waiver before each class; however, free opportunities are available every Tuesday through June. A full list of winter activities offered through the family center can be found here. Let the Chippewa River District Library host your family date night! On February 8th, families can join Kim Darst from Husky Haven Sled Dogs as she shares her experience competing in the Iditarod Trail Sled Dog Race in Anchorage Alaska. You’ll also get to stand on her sled and interact with one of her dogs! Pizza from Dominos Pizza also provided. Head on over to Mid Michigan College’s Harrison campus for a Winter Blast February 9th, 2019. Families can learn how to geocache, create a pine cone bird feeder, learn how to snowshoe, ride a fat tire bike, test out hockey skills, and relax with a cup of hot chocolate. Event takes place 10am-2pm. 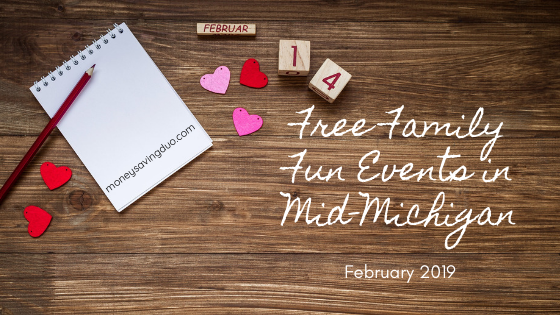 On the first Saturday of every month families in the Mid-Michigan region can participate in free Kids & Culture events hosted by Art Reach of Mid-Michigan. This February 9th, kids and families are invited to the WCMU Public Media studio to participate with PBS’s latest program, Lets Go Luna. The event is scheduled from 10am – 12noon and will include a story time and valentine-making craft. Whether you or your child is a plane enthusiast, this event is unique in that it gives kids the opportunity to go up in an airplane and learn about flying from the perspective of a trained pilot. This Young Eagle Rally is taking place February 9th from 9am – 12noon at the Jack Barstow Airport in Midland. Call Jeff Gallant at 989-948-4704 to register for this event. Stop by Barnes & Noble on February 11th for a free evening story time at 7pm. This event is great for children ages preschool and up. Love legos? Love Target? Then you’ll love the free LEGO movie 2 event Target is hosting at its stores February 16th, 2019. Kids can help Emmet build a ship with available lego blocks, play a game, and get a vest to keep that matches Emmet’s. To find out of if your local Target is participating, visit Target.com. Enjoy a free movie thanks to the Salvation Army in Alma on February 17th, 2019. I Can Only Imagine will be playing in the chapel theater while Incredibles 2 will be playing in the community room. Bring some snacks and enjoy the movie of your choice. Event goes 5-7pm. Have your kids ever wanted to try hockey? USA Hockey is hosting a Try Hockey for Free event at rinks across the US on February 23rd, 2019. Go to tryhockeyforfree.com to find a participating rink near you. What sort of adventures will you find this February? Be sure to share your favorite free events with us in the comments or on our Facebook page. here οn this post. I’ll be returning to your site for more soon.